To do good deeds unto others is a mitzvah. To those of you who are unsure what the word mitzvah means, it’s a Golden Rule – do unto others what you would wish upon yourself. Spring brings renewal to an outside world left barren for the cold winter months. It is this renewal I ask you to keep in mind as us who are more fortunate than others give back to those who deserve it most. 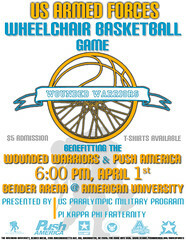 American University is hosting the Armed Forces Wheelchair Basketball game at Bender Arena on April 1 at 6 p.m. The game features Walter Reed Army Medical Center’s “Wounded Warriors” as they take on the San Antonio’s Brooke Army Medical Center team. All proceeds from this event benefit the Wounded Warrior Project and Push America. University President, Neil Kerwin, will be attending and speaking at the event in addition to wounded veteran and Wounded Warrior Project representative Ryan Kules. Can’t make the event? The Pi Kappa Phi Fraternity – Theta Eta chapter from American University, the game’s organizers, encourage you to make a donation to the cause. For more event information, visit the event’s website or its Facebook event page.